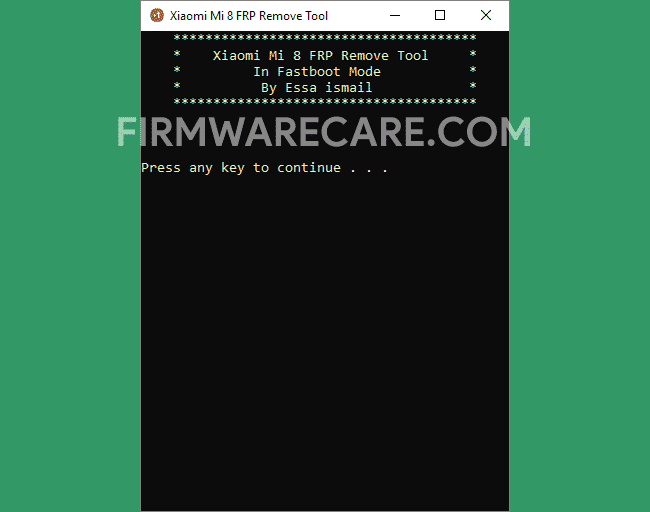 Xiaomi Mi 8 FRP Tool is a small application for windows computer created by Essa Ismail, which allows you to remove or bypass the Androdi FRP protection from your Xiaomi Mi 8 Smartphone in single click. In order to use the Xiaomi Mi 8 FRP Tool, you need to install the Universal ADB Driver on your computer. Once you have successfully installed the driver, you need to connect you Xiaomi Mi 8 Smartphone to the computer using the USB cable (with usb debugging enabled). Once your device is connected to the computer, you need to launch the Mi 8 FRP Tool. And once tool is launched, you need to press any key from the computer keyboard to continue. On the next screen it will automatically process and remove the FRP protection from the Xiaomi Smartphone in few seconds only. [*] Compatibility: The Xiaomi Mi 8 FRP Application runs perfectly on Windows XP, Windows Vista, Windows 7, Windows 8, Windows 8.1 and Windows 10 (32 bit and 64 bit). [*] Credits: Xiaomi Mi 8 FRP Tool is created and distributed by Essa Ismail (developer). So, full credits goes to Essa Ismail (developer) for sharing the tool for free.